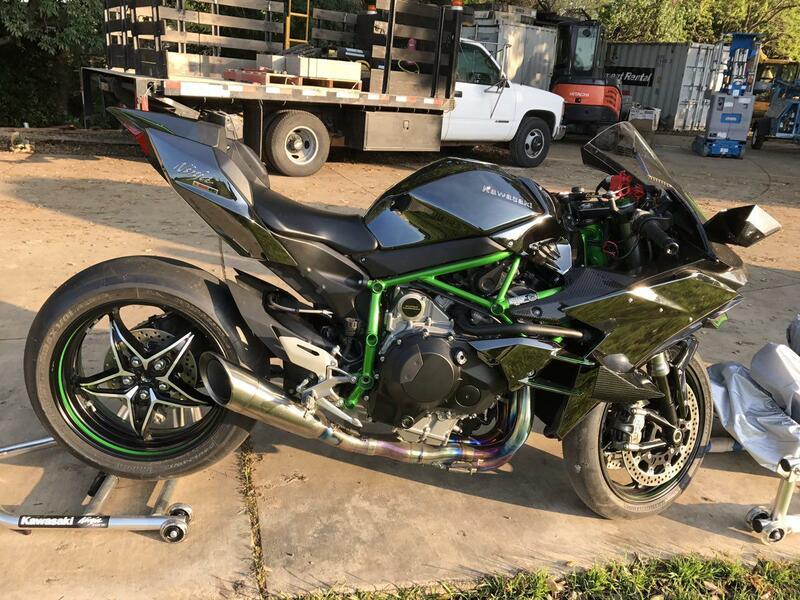 When you could still order one, a 2017 Kawasaki Ninja H2 would run you $28,000, dear for a sportbike, to be sure, but somehow still less than a Harley Road King. Give the thing a year, though, and just under 1,000 miles of use, and the prices will fall below the $20k mark, just like this 2016 model, listed at $18,999 buy-it-now. 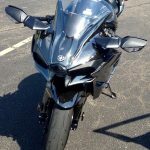 It's still a lot to ask for what is, after all, a used motorcycle, but there are not and never will be many H2s, so depreciation shouldn't be a huge concern for too much longer. As you would expect with any next-to-new bike, this one is spotless, though the tires look as if it was not babied for its 924-mile life. There is very little in the way of a description, but if you don't know about these things, chances are you ain't lookin' for one. 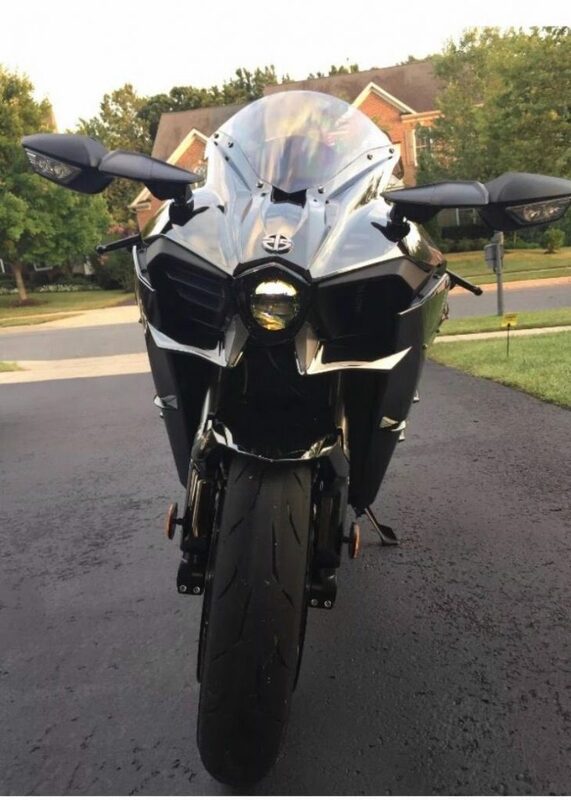 In case you do need a refresher, here is the quick and dirty: 998cc inline four, ~210 horsepower, supercharger, 530 lb wet, ABS, traction control and launch control. Sometimes, bikes are meant to be accessible, and offer real-world riding fun and performance. Sometimes, they're just meant to showcase potential, to flaunt a manufacturer's capability, to kick sand in the face of competitors. The H2 and H2R fall into this category. 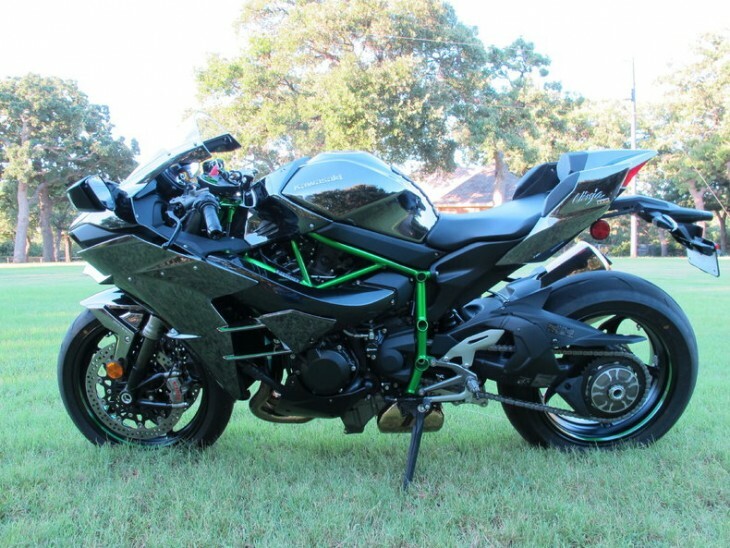 Does anyone actually need a nearly 300hp track-only motorcycle? Of course not. Reviews of the bike regularly use phrases like "mind-blowing" and "I needed to change my shorts." 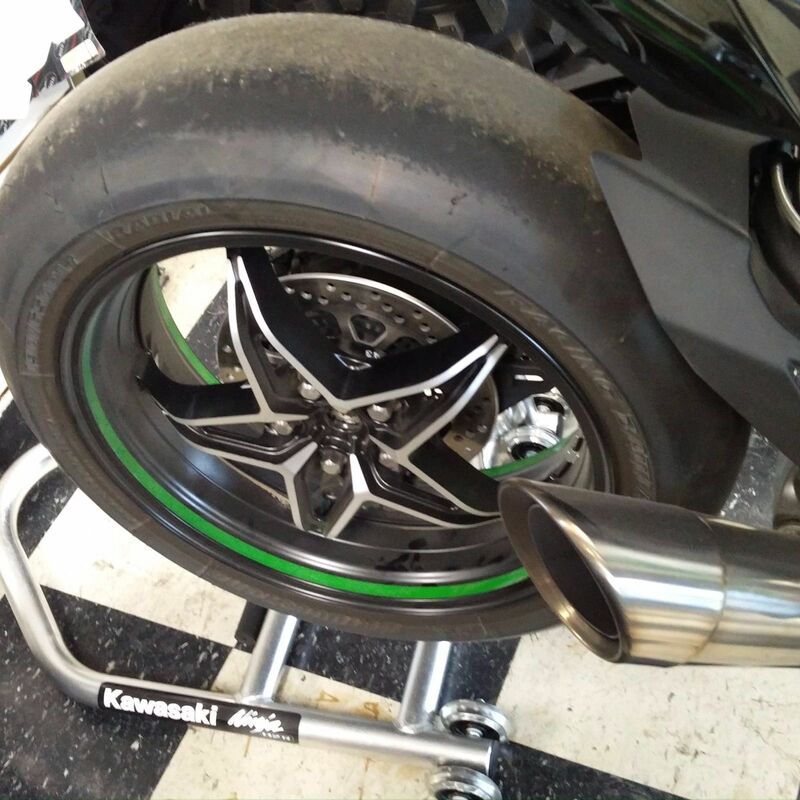 Sure, it's really too heavy for a track bike, doesn't fit into any race-legal category, makes too much power to be practical, and will probably cause nearby dB meters to melt but, as a statement of what's possible, you can't beat the Kawasaki H2R. Named after the fabled two-stroke triple of the 1970s, the new H2 is a much more well-rounded beast: it's got actual brakes and a frame that doesn't hinge in the middle, for example. It's heavy, at 475lbs full of fuel, but that just helps add a bit of stability to keep the supercharged engine's power from looping it over backward at every opportunity. That's certainly something it has in common with the old two-stroke: shocking performance. And striking looks: the older bike was fairly conventional-looking but came in some wild, 70s colors. The new machine is seriously evil-looking with a bright green trellis frame and mirrored bodywork that looks stunning in person. To clarify, if you've seen one of these on the road, you were most likely looking at the road-legal H2 version of the bike. That makes do with around 200hp and comes with a headlight, taillight, and rear-view mirrors. 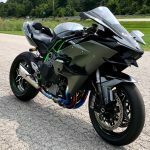 The H2R ditches all of the DOT-required frippery and replaces the mirrors with a set of evil, mantis-forelimb-looking winglets made of carbon-fiber that will set you back a cool $1,500 a piece if you tip the bike over... The slick-shod R also comes with 35psi of boost and somewhere near 300hp that's accompanied by an ear-splittingly loud exhaust. Seriously, you won't be able to ride this track-only bike at any race track that has a dB limit, and British journalists weren't even able to test the bike on their home turf because it is too loud for most tracks there. So what is the H2R? It's an indulgent track day toy, a living room showpiece, a collectible motorcycle that's likely to appreciate in the future. 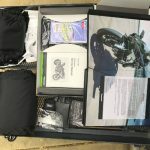 Today's featured listing is several years old but is basically a brand new motorcycle, and comes with all the factory goodies. H2R! Yes! For sale, real! You can buy it today! 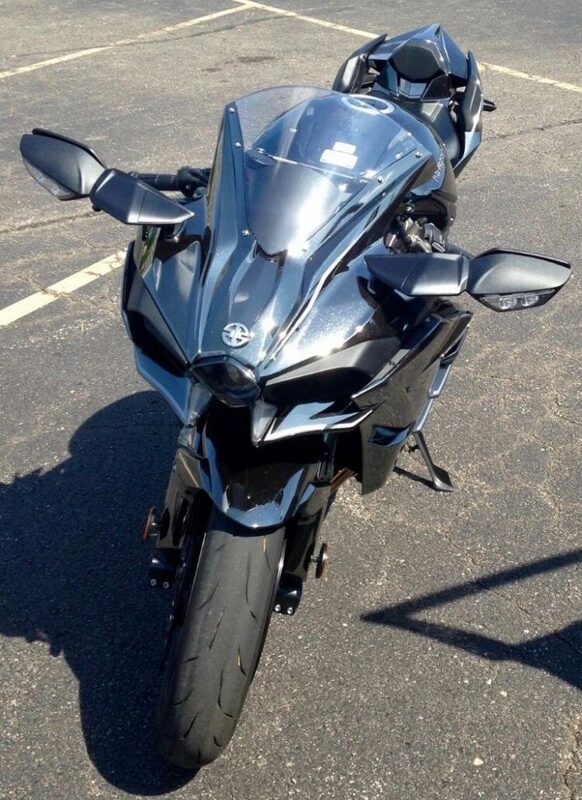 Not wait for 8 month from the factory just has 99 miles on it without any issues, the bike looks like brand new. (May ride it more until time of sale.) I can modify this bike for street legal also, the headlight, mirrors, turn signals, number plate holder, tires, must change. I can do it for $1500 for you. But as I heard it is not able to register in CA still. Registration will be by you. I do just technical job. Can ship all over the world for just $3000 (include insurance) in 3-5 days. As the custom Tax in importing countries may be high, we can make the bike as CKD (remove fairings, wheels, forks, tank and pack in as parts) for free! H2R made just 20 in 2015 and 20 for 2016. no 2017 production anymore. 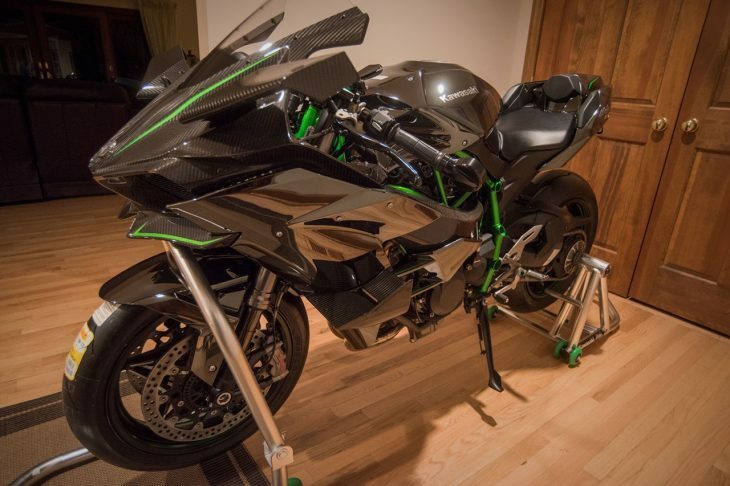 The H2R sold for $53,000 when it was new. This one is basically new, with barely 100 miles on the odometer, and the seller is asking $49,000. For the second year, the frame was changed from the lurid, metallic green seen here to a silver to match the bodywork. It's classier and more subtle for sure, but I think that sort of misses the point. This bike exists to be outrageous, to shatter eardrums, to overwhelm, to offend. 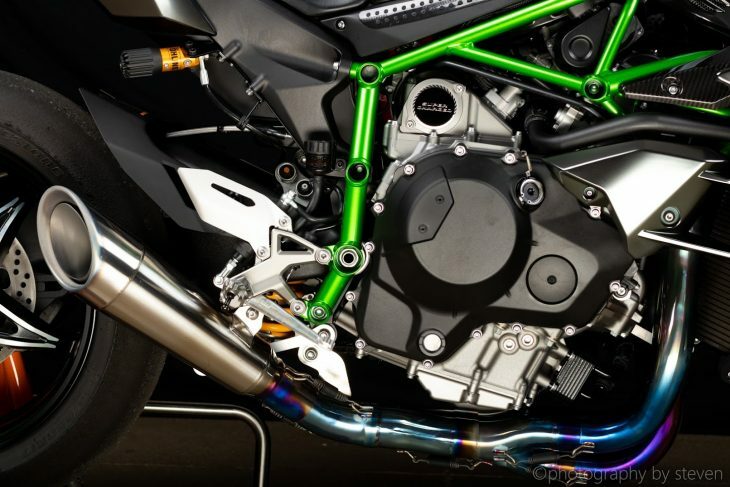 The "regular" H2 might have been at least on the same planet as more familiar machines, but the H2R is on another level altogether. 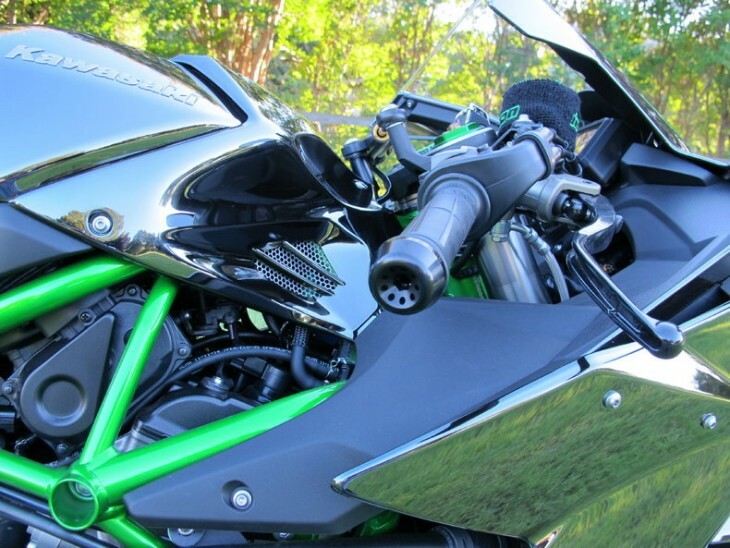 Originally released in 2013, Kawasaki claimed the H2 was the world's first supercharged production motorcycle (a sad nod to Roehr, notwithstanding). 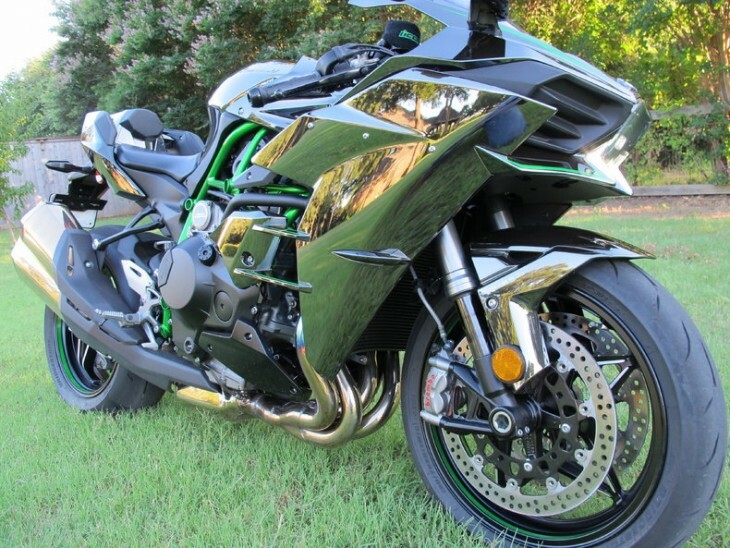 In street bike form, the H2 is a 200 HP contender. In the "R" format (delete lights and turn signals, add more boost, carbon fiber aero bodywork and slicks), this is a 300+ HP rocketship for the wealthy. Today's example is the R model - which was intended as a track day machine, hence the R stands for Race - but it could have just as easily stood for Rare. Not many H2Rs come our way, which is a shame. 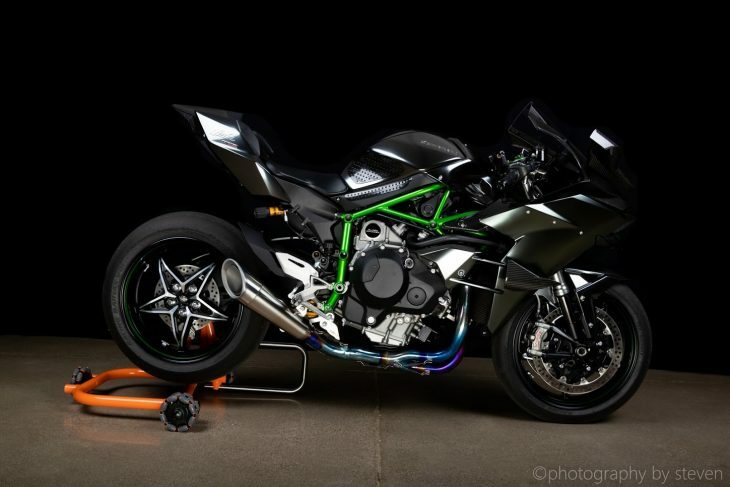 This is the fastest, most powerful production motorcycle on the planet by a long shot. 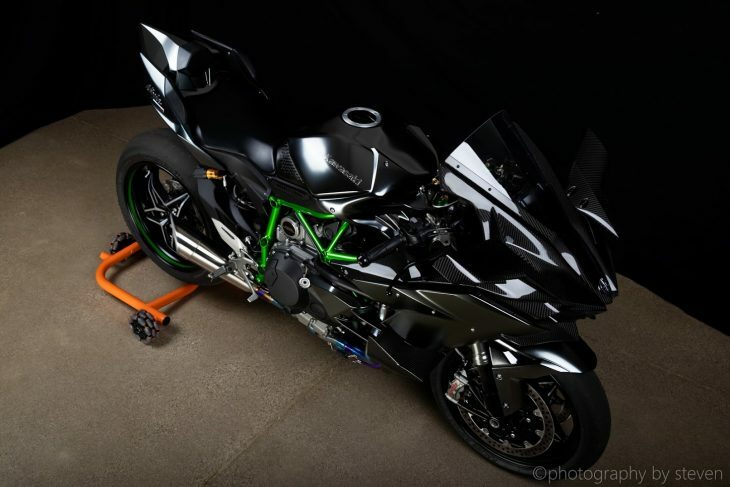 Looking like it was formed out of a billet block of dark matter, the H2R is a sinister machine. Appearances do little to mask what lies beneath; a 998cc inline four cylinder with a two stage supercharger. Far more linear than a turbo, the centrifugal blower unit produces on-demand power throughout the rev range. 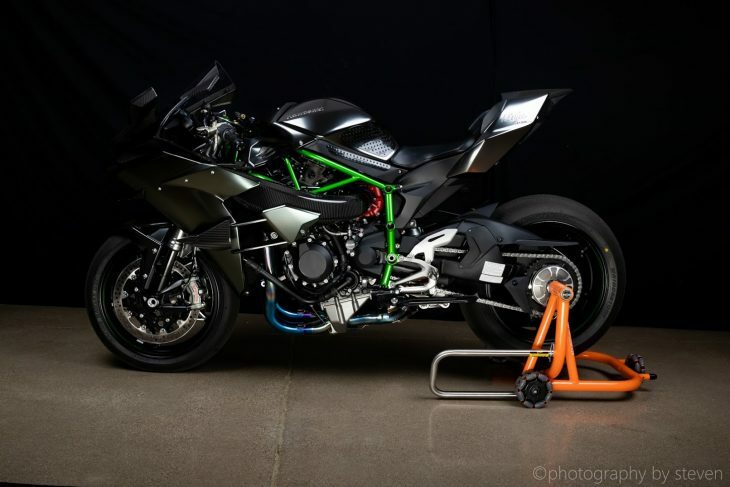 The H2R actually runs lower compression than the H2 street model, but makes up for it by dialing up the boost to 35 PSI. 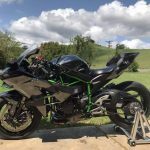 Along with a different cam profile and revised electronics tuning, the H2R rolls out with 310-325 HP (depending on whose dyno you trust). Although it is no featherweight (at some 475 pounds), the big motor more than makes up for the heft. I can modify for you to Street legal technically by adding headlight, tail light, turn signals, buzzer, mirrors, tires. 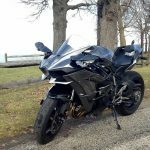 as i heard in some states you can register it as street legal after you register as track then test in CHP then regiser again as street legal. For some countries like middle eastern just with this modification it will be possible to register as street legal. The kit will be 2000$ additional to this auction. Hard to tell which states will accept this and which won't, but you probably already know which one you are in if you are reading the pages of RSBFS. Is $2k a worthwhile expenditure to be able to scare your neighbors and out drag ...well... anyone? Maybe. 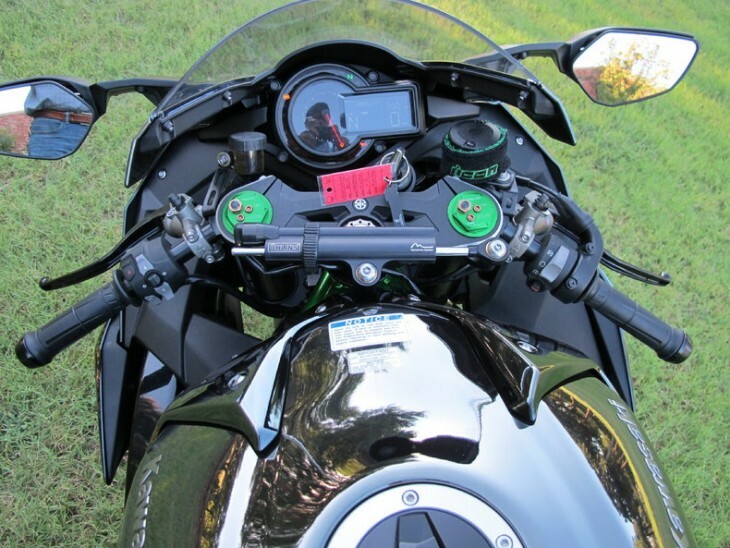 After all, Kawasaki had something in mind considering the H2R still comes with a taillight and keyed ignition. 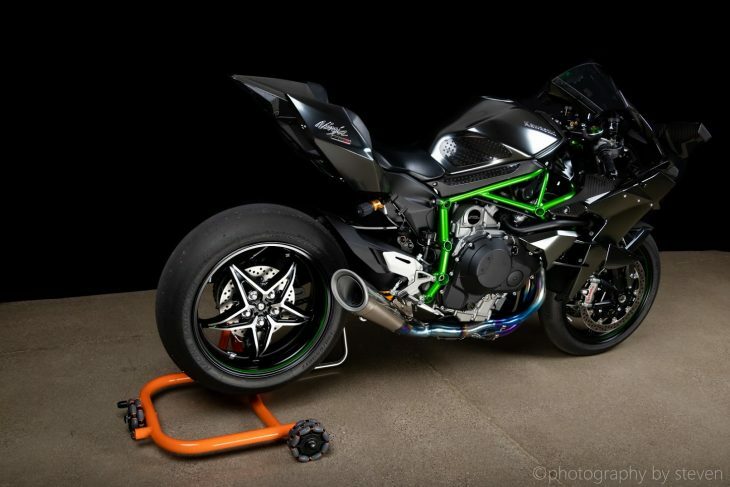 Check it out here but be warned: This bike is as expensive as it is fast. Good Luck!! You read that right. 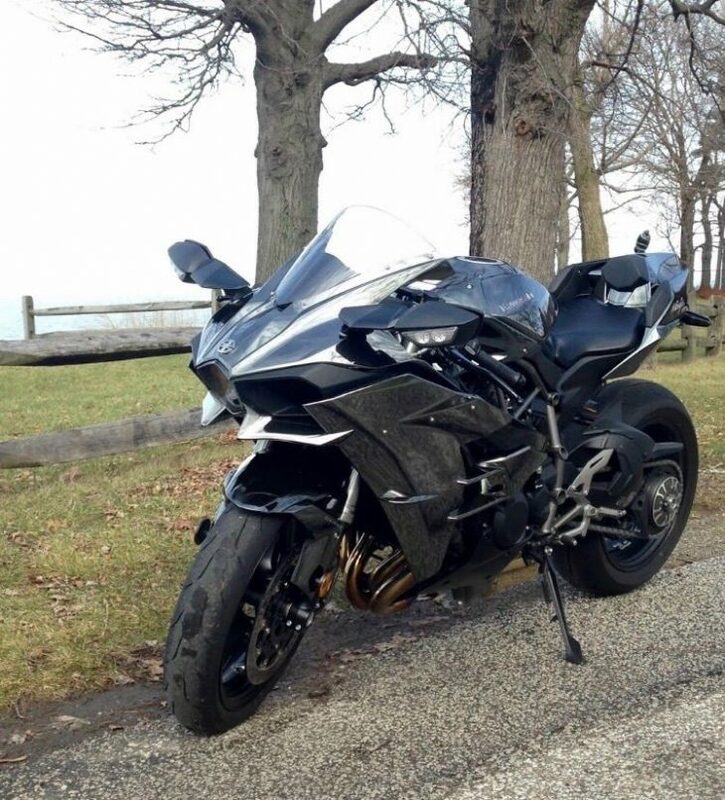 This is not an H2, it's an H2R, modified to be street legal. If you've, up until now, been confusing the two, let's be clear: we're talking about two different animals here. 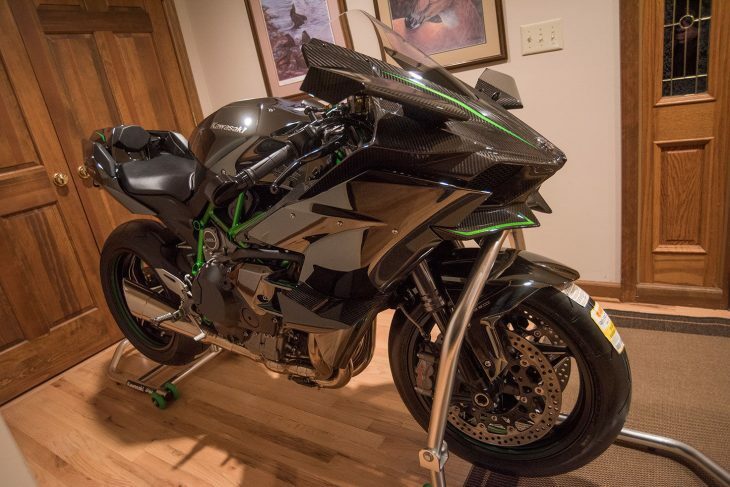 The Kawasaki H2 is the relatively mass-produced version of the bike, with headlight, taillight, turn-signals, a mere 200hp, and an exhaust that won't deafen your neighbors when you start it up in your driveway. The "R" version of the bike was in no way road-legal, lacking all of the above and arriving at your door with an extra 100+hp, a set of slicks, and an ear-splittingly loud exhaust what will deafen your neighbors. While they're on vacation. In another state. The seller addresses this, but it's worth noting that the guys at Performance Bikes Magazine weren't even able to test the H2R in the UK, as it won't meet the dB limits at any of their test tracks in stock form. So while a quieter exhaust sounds sacrilegious, tracking down a quieter (?!) Akrapovic intended for the H2 road bike might not be the worst idea, depending on your local gendarmerie. 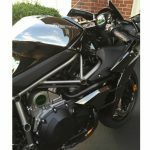 And unlike most of the bikes you'll likely see at your local bike night, all that surm und drang actually signifies something: 35psi of supercharged, four-cylinder fury. 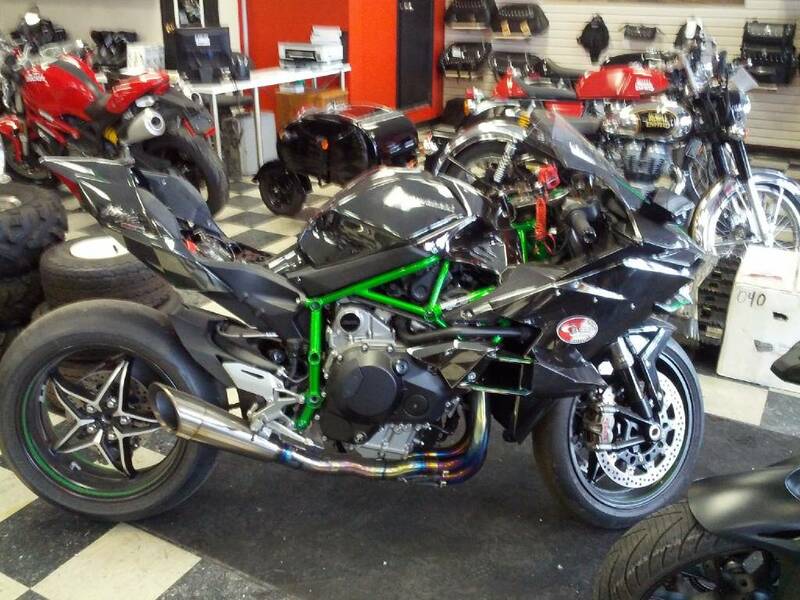 Seriously: the seller claims a dyno-tested 321hp for this bike. 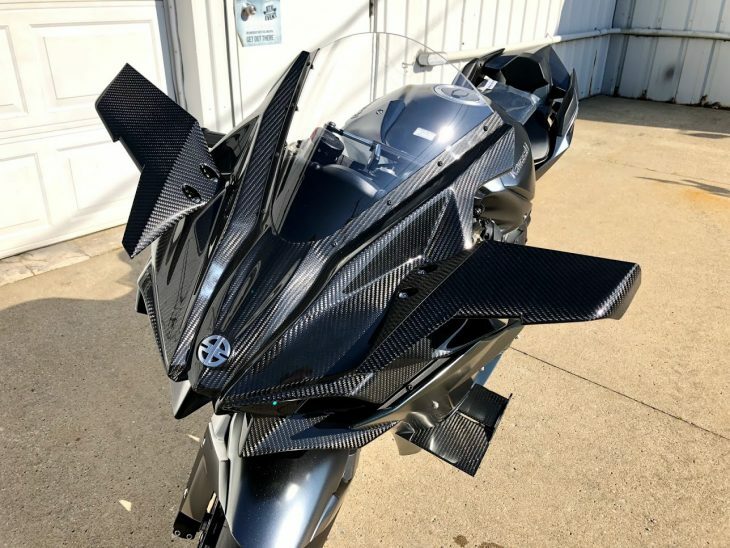 The H2 in either form isn't really a beautiful motorcycle, but that "dark chrome" reflective paint looks very trick, like you can see your evil twin lurking in the fairing and that single, hooded projector-beam headlight gives the bike a ton of cyclopean presence in the flesh. It's like the designers said, "Well, we like what Bimota is doing, but their bikes just don't have enough sharp angles and dangerous-looking projections." The only way they could have made the H2 look more sinister would be to have added actual spikes and blades to it. 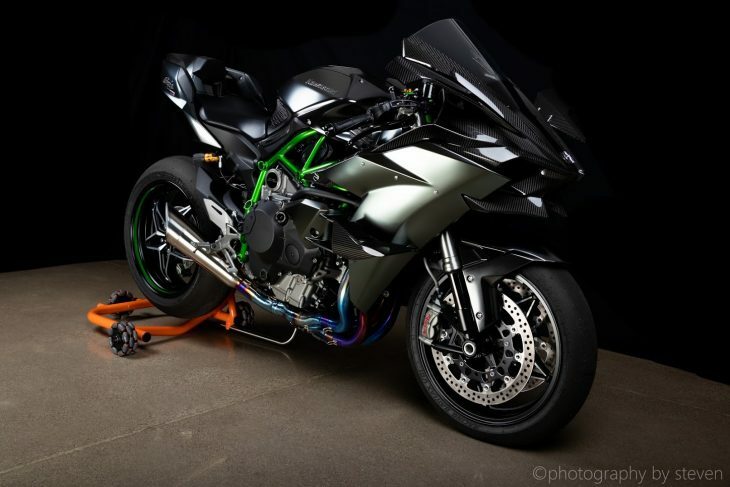 Or maybe a flamethrower... Nevermind: the H2R appears to already have one of those fitted. 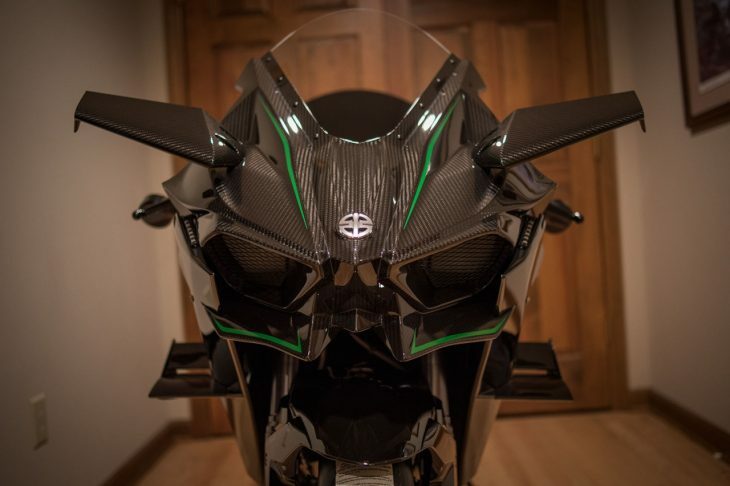 Of course, the main thing the fins and projections on the H2R are likely to hurt is your wallet: the carbon-fiber canards on the nose will set you back a cool $1,500 each to replace if you accidentally tip the bike over, or hit a seagull at 200mph. 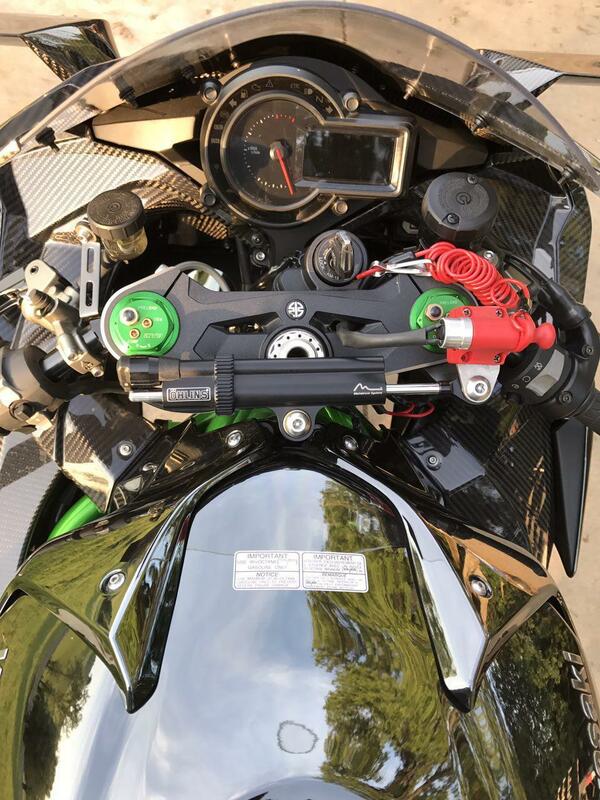 It's compact, but the H2R isn't particularly light or nimble: it's 475lbs with fuel, but with that kind of power on tap, you might not really want it to steer too quickly. Obviously, this bike may raise some red flags with your local DMV, depending on where you live, but who cares? If you can afford this bike, you can probably afford to grease the right palms to register the bike, or can just carry a wad of cash so you can bribe any public officials you run into. Or you know, just run away from them. VIN 46. H2R #10. Dyno'd at the factory @ 321.1 HP. 772 trouble free miles. Conversion works just like the standard H2; turn signals, horn, lights, fans etc. All added electronics are still under warranty (not that you'll need it). Obsessive compulsively detailed and maintained to the letter. Oil and coolant last changed at 602 miles. 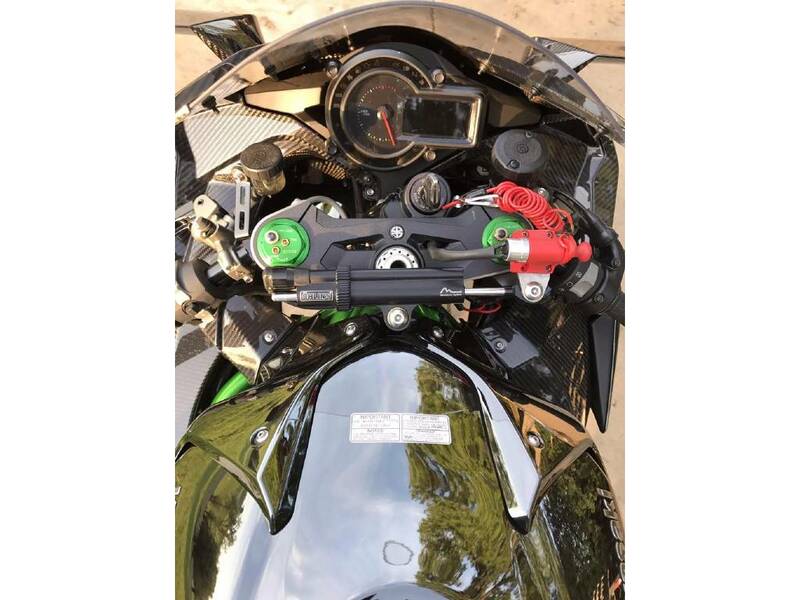 Fuel used always 94 octane or higher (ethanol-free, no power boosting additives EVER or oxygenated fuel) - no ethanol-blended fuel was allowed to sit in the bike for more than 24 hours per Kawasaki's instruction. 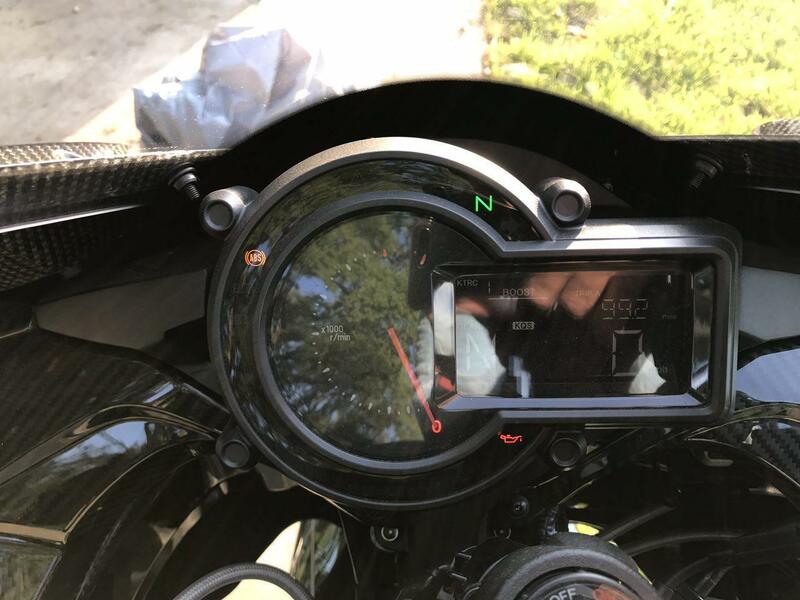 Service hour meter hasn't moved yet - meaning the chances of you having to do any more maintenance than you would on a standard H2 (or any motorcycle) is ABSOLUTELY ZERO. (Its fifteen hours OVER 8K RPM for the first scheduled checkup - no maintenance - and 30 hours over 8K for actual service. If you ever see that day it'll be decades from now and your adrenal gland will be deflated from overuse). 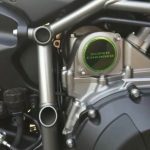 Increased maintenance on the H2R is an internet myth. 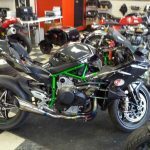 Mods besides the conversion; the DNA air filter, lithium battery, Expel tank wrap and Pirelli Diablo Supercorsa SC's. 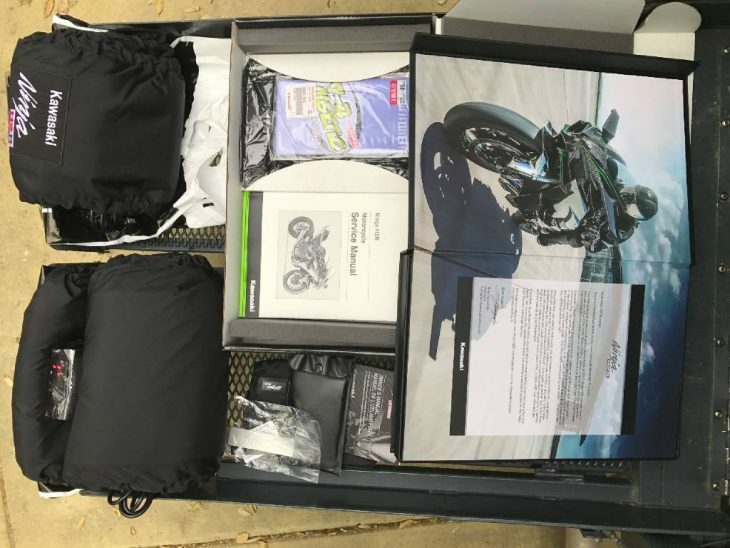 Comes with everything including the takeoff slicks, untouched gift box, extra oil filter, lifting straps, tire warmers, shirt still new in the bag etc. Has a clean Ohio title and current registration good until 6/2017. Depending on your location the only caveat is the stock exhaust. Dealing with it would be no more/less difficult than if you bought a regular H2 that's had its exhaust modified. 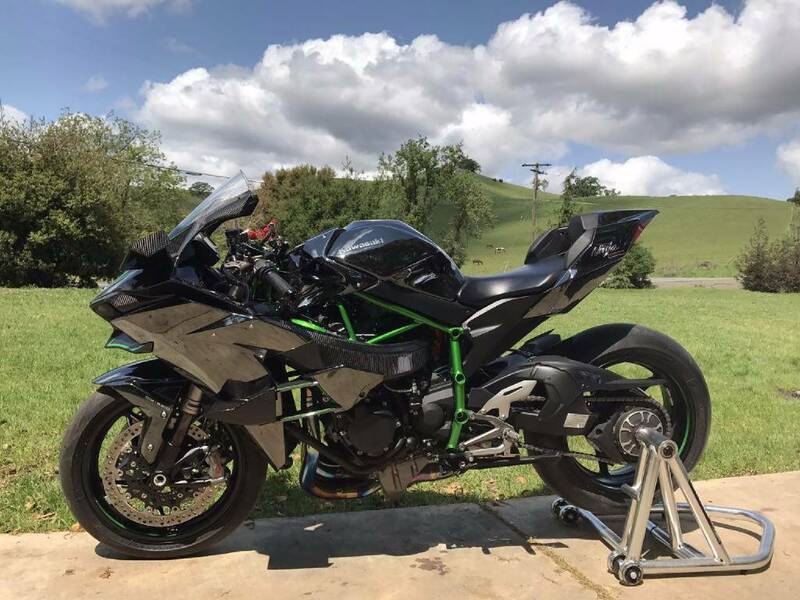 The stock H2R system is glorious but if you need to pass smog/noise requirements in your location for the sake of registration you could either buy the Akro setup or swap it for a take off stock H2 exhaust. California's requirements are likely too stringent (unless you have a 'buddy') but any of the other 49 should be a walk in the park. I rode it all summer and never got hassled by the cops once...and I was really trying. I'm willing to provide post-purchase technical support up to a year for the modifications should you have any trouble (you won't). I'll also give you the STL file for the headlight mount and a spare pre-cut Xpel wrap for the tank (I have a template). 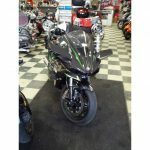 The street legal H2R conversion thread. Why am I selling it? Same reason I considered selling it last year; to convert another one. I've got a deposit on a 2017 and plan to convert it over the winter to keep my YouTube channel going. If that weren't the case this bike would never, ever, never, ever, ever be for sale. Ever. When you ride it, if you don't immediately find religion or use the F word, I will gladly take it back. Asking price? 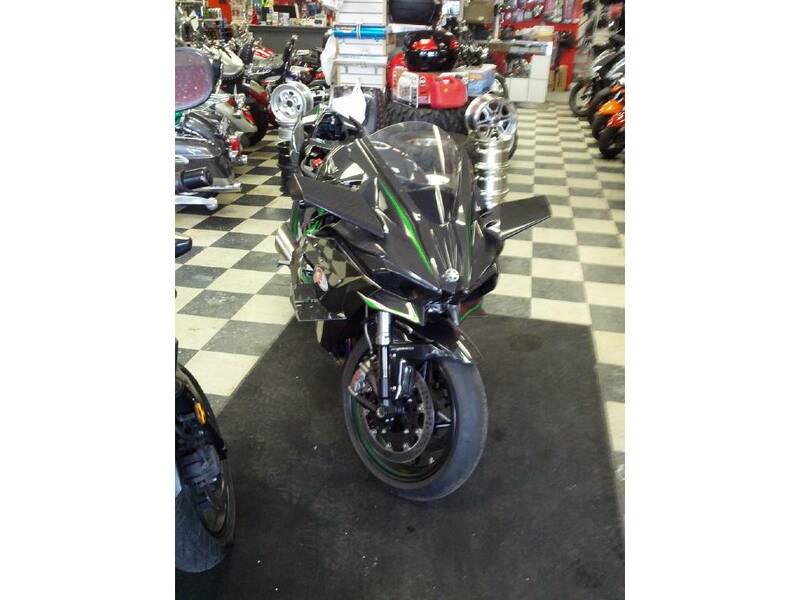 I don't have any clue what the market is since a street legal H2R has never been sold before. It brought $67K when I ran it on eBay 6 months ago and I know from experience I'll have at least 70K in the 2017 by the time I'm done converting it. I'm not having a fire sale and I don't really need to sell it - but - I also don't need two H2Rs. I'm not intentionally being obtuse but really the market is going to dictate it's value, not me. If you're serious, lets talk about it. The original H2 was an affordable musclebike from the era of cheap gas, a bike that was all engine, with a frame, brakes, and a gas tank added almost as an afterthought. The new H2 is a cutting-edge dream bike, meant to showcase Kawasaki's engineering might and capability of out-of-the-box thinking. 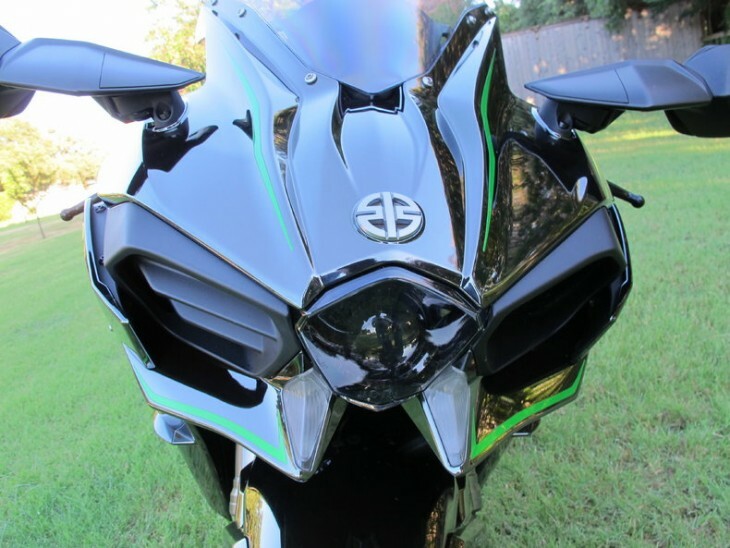 It offers up the blunt-force appeal of the original, with big helpings of technology and high-spec components so that owners can live long enough to parent a whole new generation of Kawasaki addicts. So what's this one-off monster worth? 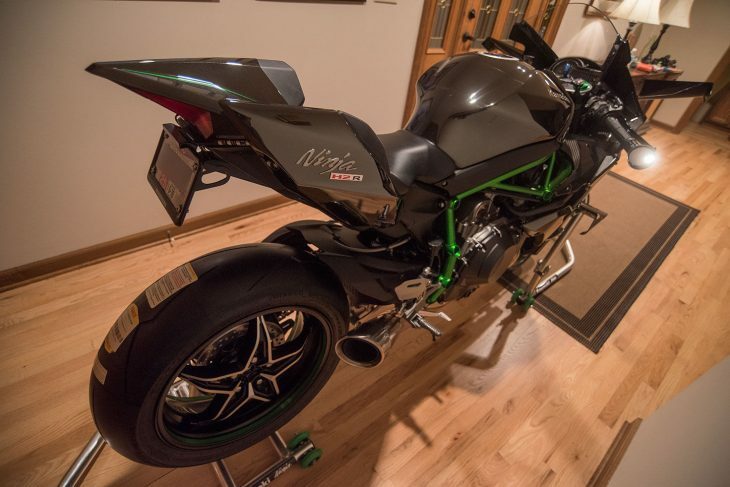 Well, an original H2R sold for $53,000 in 2015. In the minus column? Well, it loses maybe a couple points from a collectability standpoint for not being completely original. In the plus column? It's possibly the only bike of its kind in existence and is really what the roadgoing H2 should have been from the start. As the seller says: make an offer. 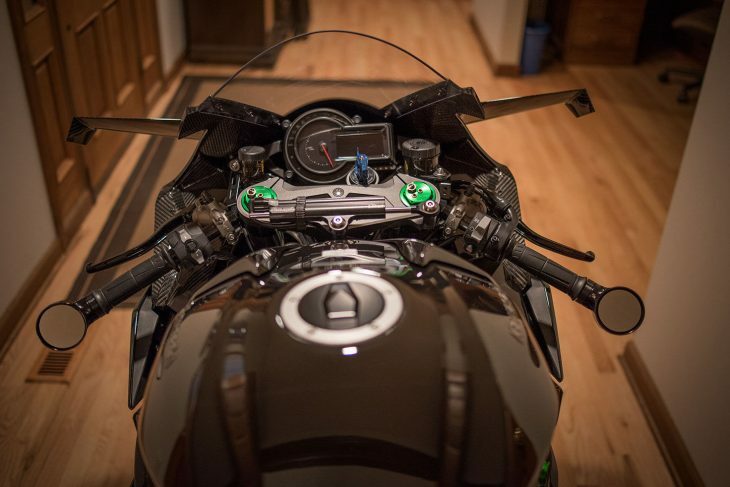 It's clear from the description that this bike is about as perfect as it's possible for it to be, has been meticulously maintained, and is probably one of the fastest road-legal bikes on the planet. 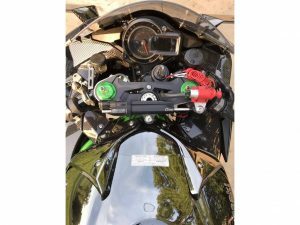 Kawasaki's new H2 is the polar opposite of the original H2 in every way except one: while both bikes can lay claim to being the maddest, fastest widowmakers of their respective eras, the new machine's premium price is a far-cry from the affordable mayhem offered by the original. Both of course offered terrifying powerplants: while the original H2 was a 750cc two-stroke triple certainly made good power, it was the delivery of the power that made the bike so potentially lethal, a 75hp light-switch hooked up to a wobbly frame and wooden brakes. 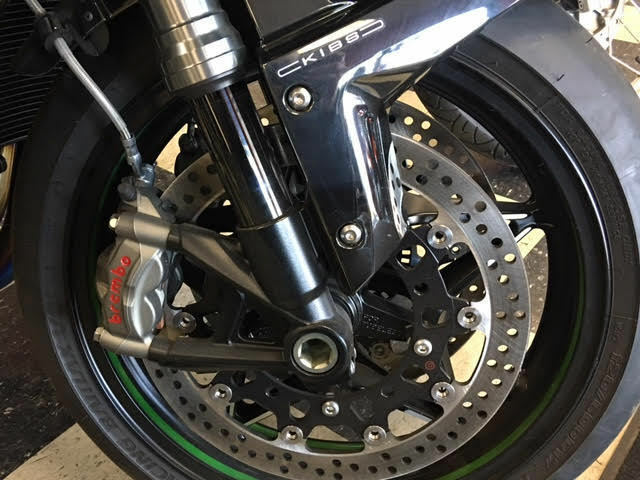 The new bike has vastly improved handling and stopping power, but all that modern technology can be easily overwhelmed by the huge power on tap, making it an equally terrifying proposition. 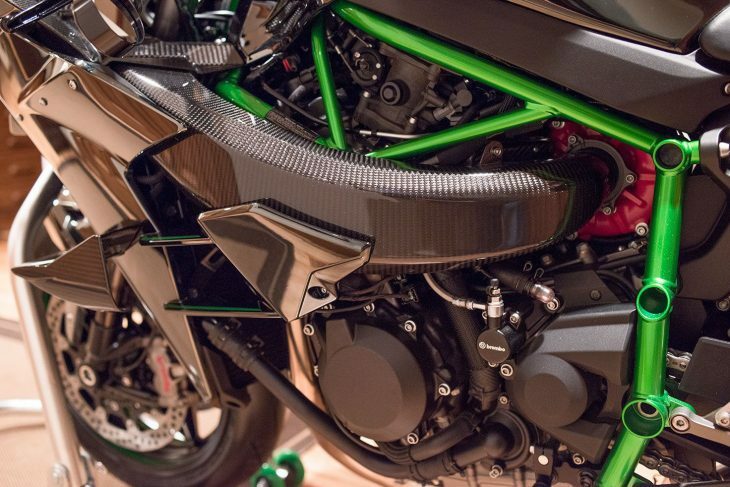 And while the new bike looks pretty sporty, it's no lightweight, with dimensions closer to the ZX14 than to the ZX10, so it's not really ideal for corner-carving, even if it's miles better than the original. The new H2 thinks it's a V8 musclecar, and makes its power the old-fashioned way: with a supercharger. 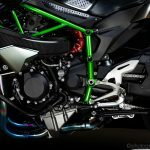 So while we've seen recent bikes within shouting distance of the H2's 200+ tested rear-wheel horsepower figures, the new Kawasaki will absolutely destroy those bikes' midrange power figures and crush them in a top gear roll-on. It's a much more complete package than the original, with brakes, handling, and power, but that more complete package comes at a price. 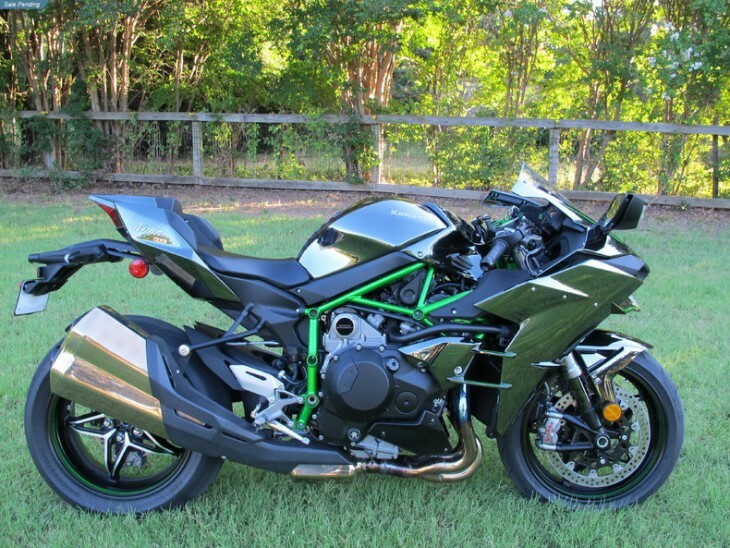 While the original H2 was a relative bargain, the new one has an MSRP of $25,000, obviously putting it into MV Agusta and Ducati territory, although the Kawi offers miles more exclusivity than any Italian bike in that price range. These are most definitely not pretty bikes: the design is far too brutal and too busy for that. 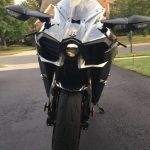 But they have undeniable presence, and while many sportbikes have a predatory, insectile quality to their styling, the H2 looks positively sinister. I particularly like the headlight, a staring, projector-beam piece that looks like a shark's eye. And that cool "dark chrome" paint is very striking in person. Heroes don't ride bikes like this. No, the cyclopean H2 is most definitely a villain's bike. This bike was purchased new and ridden 300 miles, we are now offering it for sale. It comes with the balance of the factory warranty. Its a beautiful machine. below is the technical information on the bike, it is a technical dream bike. 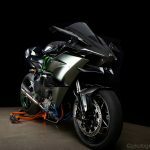 The launching point for the development of the Ninja H2 motorcycle was a strong desire to offer riders something they had never experienced before. Convinced that an extraordinary riding experience would not be found by merely building on the performance of existing models, the design team committed to developing the "ultimate motorcycle" from a clean slate. These have been sold out for months, but they're starting to show up in classifieds and on eBay by folks looking to flip these exotic machines for a quick profit. 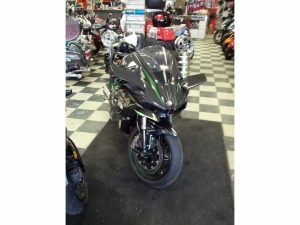 But considering the bike is listed with a Buy It Now price of $24,900 the seller seems to be realistic in their expectations. Maybe the original owner decided they were more interested in something less dangerous. Like wingsuit flying or free climbing.